For most of us, the new year begins on January 1. That’s because the Gregorian calendar (the one commonly used in the world today, named after Pope Gregory) indicates that January 1 is the beginning of a new year. 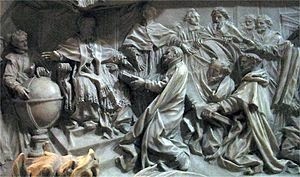 In many parts of western Europe, throughout the Medieval period, the Renaissance and even into the eighteenth century, March 25 was considered the beginning of the new year, reflecting the idea that with the Lord’s conception a new age had begun. There was also a tradition that March 25 was the day on which the world was created, thus joining the first creation and the new creation in one day. It follows then that, during most of America's colonial period, March 25 was the first day of the new year -- marking nine months before the celebration of Christ’s birth on Christmas Day. According to the Book of Common Prayer, the Feast of the Annunciation commemorates the announcement by the angel Gabriel to Mary that she would be the mother of God’s son, Jesus, and Mary’s assent in faith to God’s invitation. In 1750, for example, the year ended on March 24, 1750. The following day was March 25, 1751. In that time period, New Englanders were still considered part of Great Britain, which continued to use the "old" Julian Calendar (named after Julius Caesar). Thus up until 1754, New Year's day was observed on March 25 throughout the English-speaking colonies. Since Roman times, beans have been associated with good fortune, a belief that evolved into the custom of eating black-eyed peas on New Year's Day. 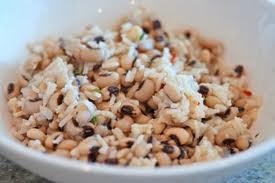 In the southern American colonies, the legumes, which arrived on ships carrying slaves from Africa, found their way into a good-luck dish called hoppin' John, a mixture of black-eyed peas, rice, and salt pork or bacon. Cabbage is another popular New Year's Day dish believed to bring good luck. And in some cultures, backward-moving creatures such as crayfish and lobster are avoided on New Year's Day, because it's a time to move forward, not back. The custom of singing "Auld Lang Syne" at midnight on New Year's Eve originated in the British Isles around the end of the 18th century, when it was common to end all parties with the song, usually with celebrants joining hands in a circle. This song was especially popular in Scotland, because the melody stemmed from a traditional Scottish folk tune, and the plaintive lyrics are generally credited to Scotland's national folk poet, Robert Burns. translates to "old long since," meaning the good old days. Susan F. Craft is the author of the SIBA Award winning Revolutionary War romantic suspense, The Chamomile. She is represented by Linda S. Glaz, Hartline Literary Agency. I've read and enjoyed The Chamomile. Thank-you for that book. Sharon, I'm so happy you liked The Chamomile! Happy New Year to you and your family.